Overlooking a historic garden, Sushi Wakon offers an quintessential culinary experience that marries the best of Kyoto and Edo traditions. 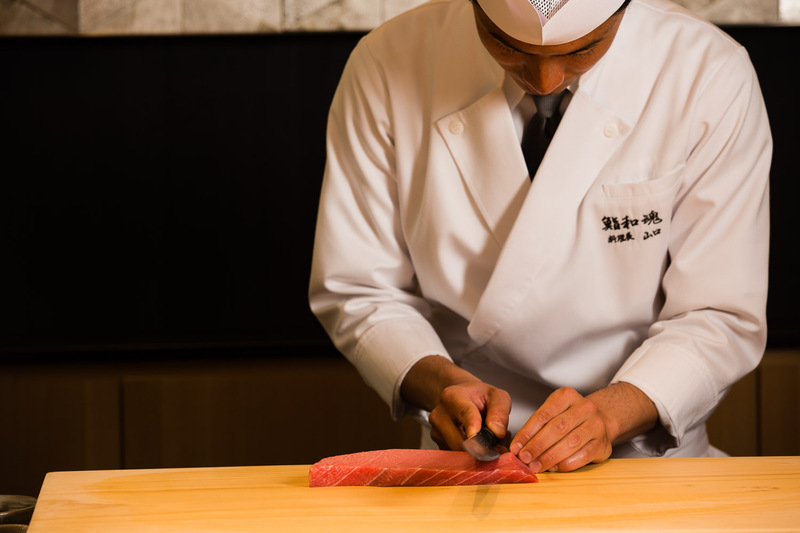 Curated by two Michelin-starred Chef Rei Masuda, the restaurant perfects the art of sushi with freshest catches from Tsukiji. Immersed in modern Japanese décor and world class hospitality, indulge in the wonderful flavors of the season. The Sushi Wakon experience begins the moment you enter the grounds of Four Seasons Hotel, which took on the 800 year-old Sekisuien pond garden in Kyoto’s scenic temple district in 2016. Walking through the picturesque greenery, you sense a feeling of tranquility and appreciation for Japanese aesthetics. As you find your way to the restaurant on the third floor of the luxurious hotel, you discover that every detail is designed to link the garden’s natural beauty to the artistry of the ancient city. The museum-like space is curated with rare artifacts like kyo-yaki art by Miyagawa Kosai, each piece carefully chosen to celebrate the four seasons. 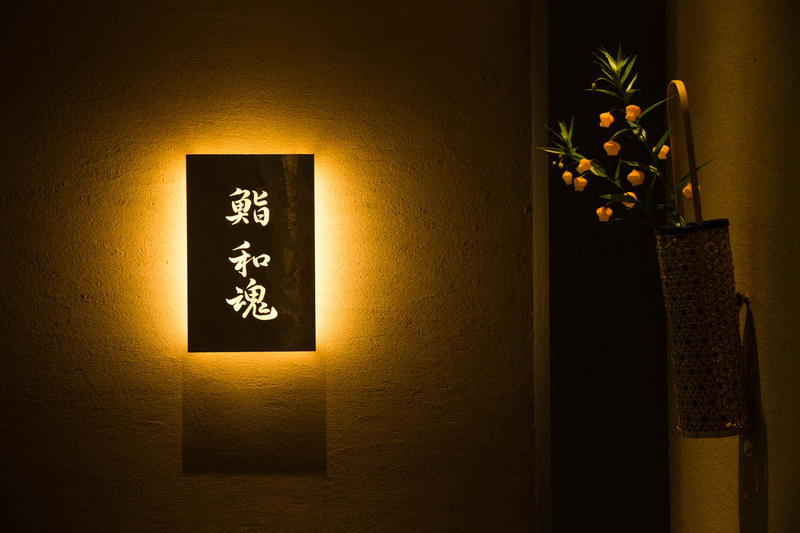 The entrance is decorated with an intricate tin sculpture of branches, where the restaurant’s top-trained staff await to greet you in Japanese, English and Chinese. Guided by their warm welcome, you enter the spacious main room. The beautiful hinoki wood counter is the work of Yasuimoku Komuten, a company built by generations of Kyoto craftsmen. 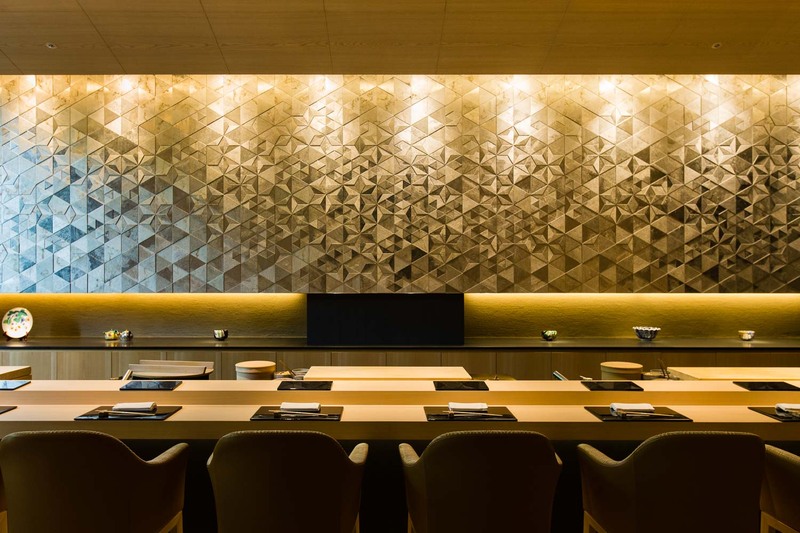 The metal tiles on the wall behind the counter is also handmade, resembling the delicate art of origami. Three top-notch chefs stand on one side, ready to serve the ten lucky guests seated across the eight-metre long counter. The table is deliberately narrow to close the distance between the chefs and the guests. There are also two private rooms that fit 4 and 8 guests, providing a relaxing set up for groups and families with children. Overturning expectations of a hotel restaurant, Masuda, the charismatic chef who trained for 9 years at three-starred Sukiyabashi Jiro, is the creator behind Sushi Wakon. Recognized for its impeccable quality, the restaurant has won a Michelin star within a year of opening. Supervised by Chef Masuda, the quality of the sushi is second to none. 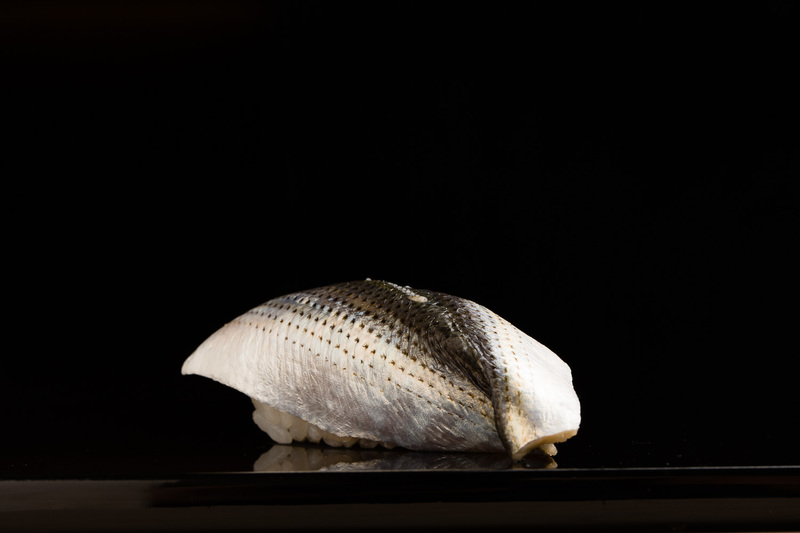 Flown in daily from Tsukiji market in Tokyo, the fish is not only of the finest grade but also the freshest. The meal flows through a series of tsumami small dishes and nigiri, which are prepared using traditional Edomae techniques. There is true craftsmanship in every morsel of sushi. If you watch carefully, you will notice how a piece of sushi “sinks” slightly the moment it’s placed on the serving board. This happens when there’s just the right amount of air between the rice grains, which makes it possible for the sushi to come apart beautifully in your mouth. 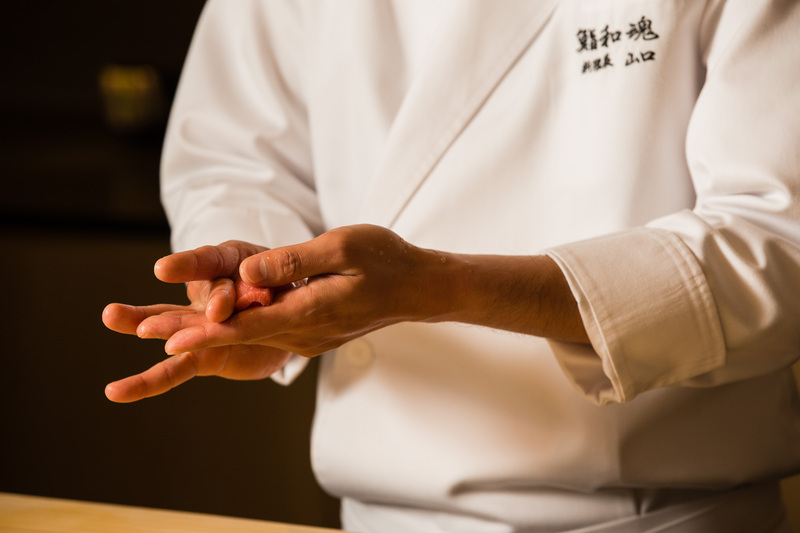 To make the simple art of sushi more dynamic, the head chef, Masashi Yamaguchi, pays the most careful attention to the temperature of each sushi. For example, shellfish is slightly cooler compared to tuna, which needs to melt quickly in the mouth. Gizzard shad is crisp and cold, while boiled shrimp is lukewarm. 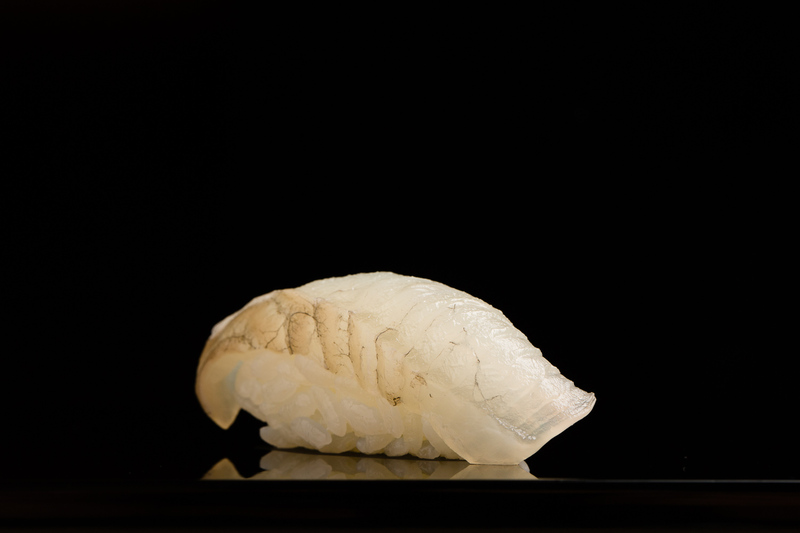 Passed down generations, classic Edomae sushi techniques are designed bring out the best flavors in each fish. 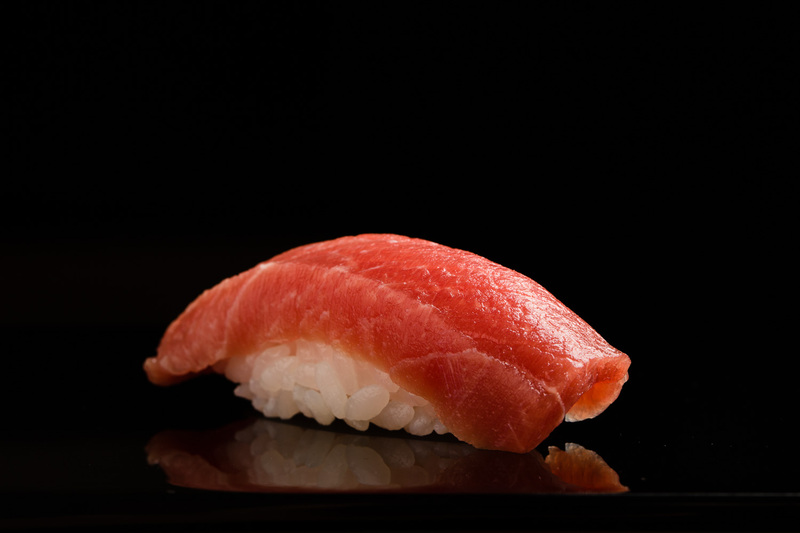 Marbled sole is rested for a day for a milder flavor, while chutoro, fatty tuna, is matured for three to four days. 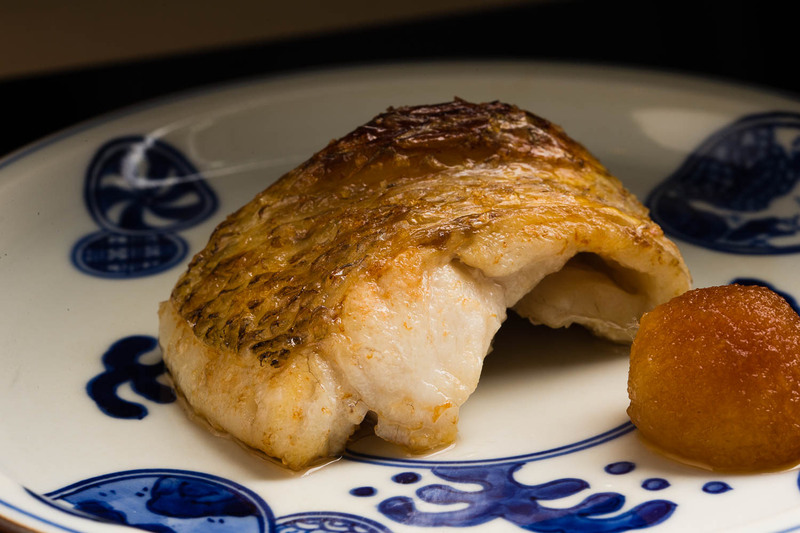 Gizzard shad, a popular Edomae sushi fish, is beautifully prepared Sukiyabashi Jiro style, with two layers of fish placed diagonally on top of each other. Mixed with grated mountain yam and Shiba shrimp, the egg omelet is soft, fluffy and moist, after it’s been steamed for 2.5 hours. The plump piece of shrimp is swiftly boiled right before the guest is ready. 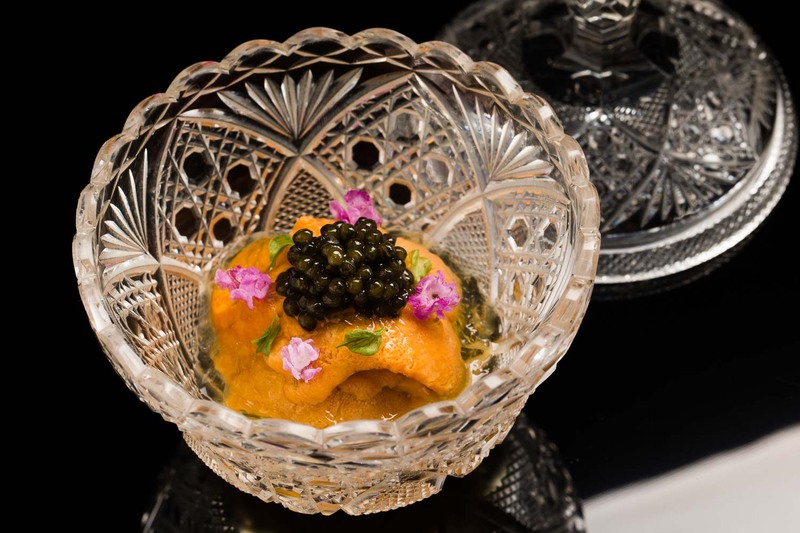 The sushi courses are complemented with summer dishes like a bowl of fresh sea urchin topped with caviar and vinegar jelly sauce. The steamed pieces of abalone, added with wave-like slits so that they mix well with the creamy liver sauce. The blackthroat seaperch is grilled over charcoal, bringing out great aroma and sweetness from its fat under the crispy skin. Enjoy with grated radish and nikiri soy sauce. Top quality sushi needs top quality fish. The restaurant orders about 15 different seasonal catches to be sent by air everyday from Tokyo to Kyoto. They make sure that the fish is kept in its best condition, such as draining excess water from the tuna. The water, so important for the flavor of the rice, comes from a source in Mie Prefecture. The soft water is perfect for sushi rice, which local Kyoto water couldn’t yield. It’s a funny little story how Yamaguchi ended up pursuing the way of sushi. A passionate surfer, he from a young age dreamed of wanting to live abroad and surf in beautiful tropical seas. When he heard that the easiest way to get a visa was to be a sushi chef, he immediately began learning at a local sushi restaurant in Tokyo. 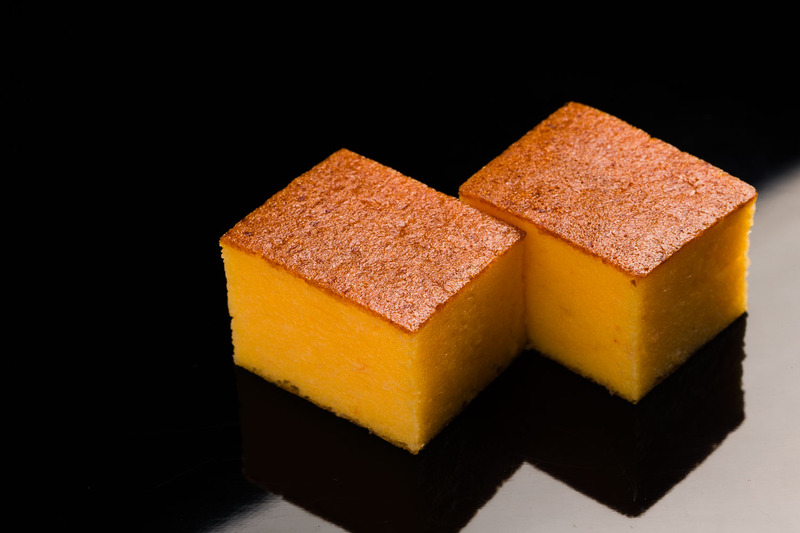 Once he mastered the basics, he went on to work at Hinokizaka inside The Ritz Carlton in Roppongi. Five years later, he went to work for Chef Masuda at his restaurant to polish his skills even further under the guidance of the master chef. He moved to Kyoto in 2016 to join newly opened Sushi Wakon as the lead chef. He quickly bonded with the team and began impressing guests with his top-class Edomae sushi techniques. 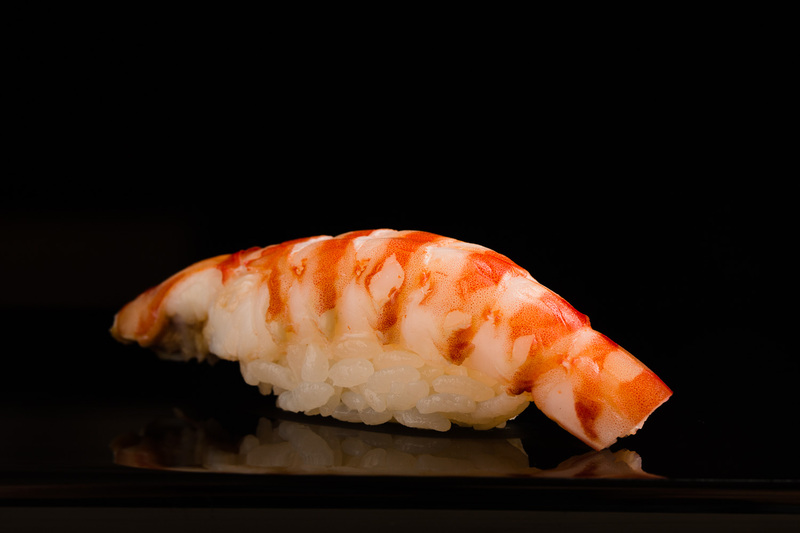 Overturning myths that there are no good sushi restaurants in Kyoto or that hotel restaurants are not great, he leads a first-class restaurant with pride and confidence. As you may be able to tell from his golden tan, he’s never given up his surfing. He even rides the waves in the winter. “I didn’t have much expectations when I first started making sushi, but now I know it was my destiny,” Yamaguchi says. Building and refining Sushi Wakon is my most important mission, Yamaguchi says. Riding on the idea of Japanese spirit, as embedded in its name, the restaurant is founded on passion to spread the art of Japanese culture to people from all over the world. 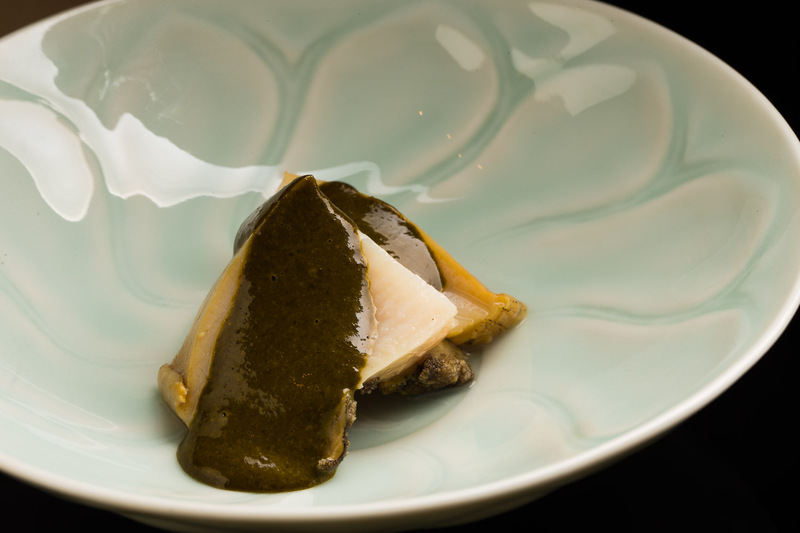 From the historic capital of Kyoto, the restaurant continues to pursue their purpose. To expand their reach, the company will be opening its second branch in Tokyo in November 2018, and another in Macau in 2019. As a hotel restaurant, he feels blessed to have so many staff working with him, and is committed to teaching and training them to become top-notch chefs. “When people hear that a chef worked at Sushi Wakon, I want them to be impressed,” he says. 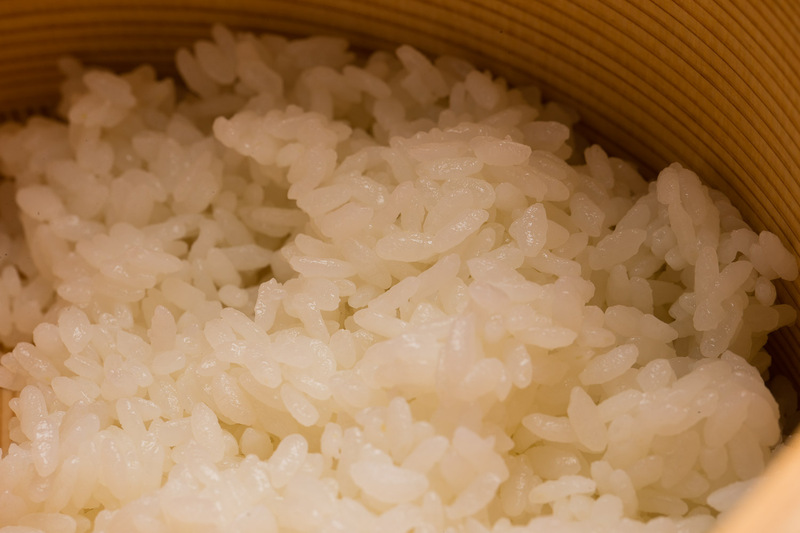 After an extensive search, the team resorted in using koshihikari rice from Yamagata or Gunma. 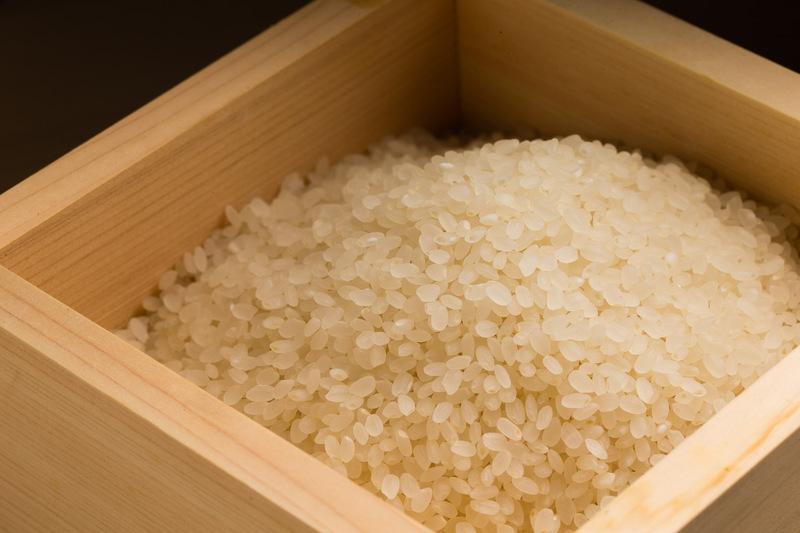 Grown in areas with hot summers and cold winters, each grain is solid and firm, making it perfect for sushi rice. The end of the rice is rounder than other varieties, helping it capture more air as the grains are molded together. The rice is carefully polished and then sifted before cooked to smooth the surface and even out the size. When popped inside the mouth, the rice has this perfect balance of texture and lightness.